The following article appeared in the winter 2018 edition of Hey Neighbor!, a free publication from Northeast Coalition of Neighborhoods (NECN). Many thanks to NECN for recognizing and sharing the work of Central City Concern's expanding Clean Start PDX program! The program began last year when Adam Lyons, Executive Director of NECN, was hearing from community members about the increase in trash and debris on roadsides, along with an increase in campers. “It’s a livability issue,” he says. “But it’s also a symptom of a much greater problem.” So, in partnership with Central City Concern, the Central Eastside Industrial Council and the Eliot Neighborhood Association, NECN secured funding from the city to address the issue in the inner eastside core. Based on the same model that the Clean and Safe program uses, the idea isn’t to enforce camping policies for the city, but rather to help make the city cleaner and nicer for everyone who lives here. In fewer than six months of operation, it’s making a big impact: between August and October alone, J.P. and his Clean Start PDX crew have cleaned up 149 camps which included nearly 2000 bags of trash and 779 needles, and all manner of bio-hazardous materials. In 2017, Central City Concern (CCC) made significant headway toward increasing the number of affordable homes in Portland, bridged service gaps with new programs, further cemented our reputation as leaders in the national conversation about how to end homelessness, and much more. But most importantly, thanks to you, CCC helped thousands of our neighbors find housing, wellness, and opportunity through our compassionate and comprehensive model of care. Below are some highlights from the year at CCC. As you read through this snapshot of what we accomplished, we hope you will feel good about all the things you made possible. July: Hill Park Apartments became home to 39 households in Southwest Portland. 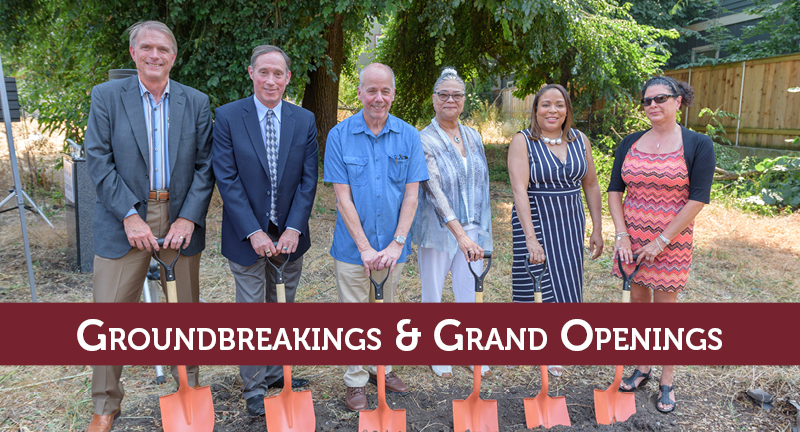 August: Charlotte B. Rutherford Place, a 51-unit apartment building for families, broke ground. September: Stark Street Apartments, which will provide 153 homes, broke ground. November: The Blackburn Building—combining a clinic, pharmacy, transitional and permanent housing—broke ground. February: Multnomah County, the City of Portland, and CCC launched the Law Enforcement Assisted Diversion (LEAD) program to help low-level drug offenders work toward recovery, find stability and avoid reoffending. February: CCC, Multnomah County’s Department of Community Justice, the Joint Office of Homeless Services and Meyer Memorial Trust together launched Flip the Script, a culturally specific reentry program that aims to reduce recidivism. March: CCC joined forces with Health Share of Oregon and CODA, Inc. to form Wheelhouse, a program to expand Medication Supported Recovery services throughout the Tri-county area. May: CCC Clean Start trains formerly homeless workers to help keep neighborhoods clean by removing trash and graffiti. The program works with the City of Portland’s One Point of Contact. January: After a fire displaced 98 residents of CCC's Hotel Alder building, community members rallied to send a flood of donations to meet the needs of our tenants. 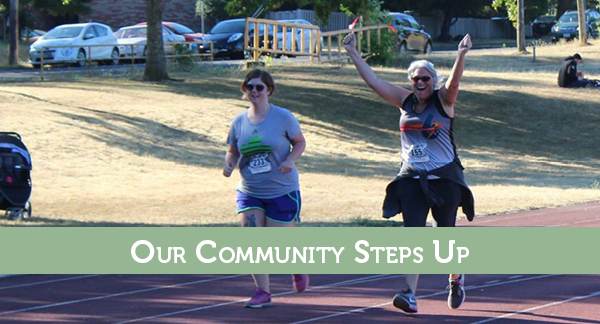 August: Close to 300 runners and walkers attended Portland's first Heroes in Recovery 6K. Proceeds of the race benefited CCC and Hooper Detox. March: The United States Interagency Council on Homelessness highlighted CCC Recovery housing. April: CCC hosted Kimberly Johnson, director of SAMHSA’s Center for Substance Abuse Treatment, for a visit that included a Recovery Housing “fish bowl” dialogue. 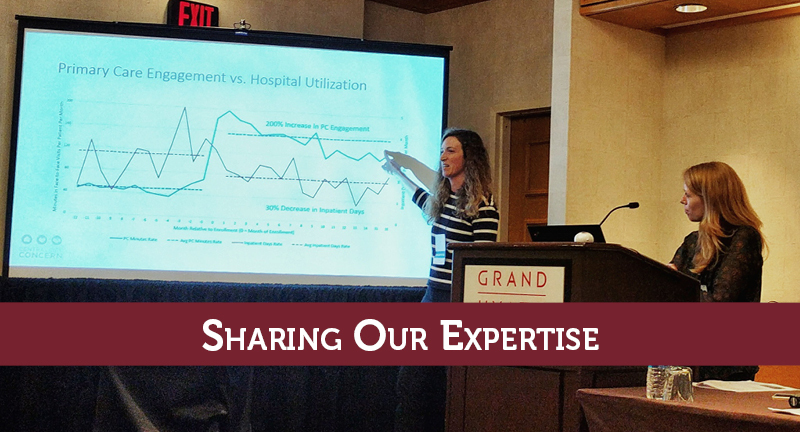 June: CCC staff members and a health care consumer hosted six informative and well-received presentations at the National Health Care for the Homeless Council’s annual conference in Washington, D.C.
January: Ed Blackburn, CCC's executive director since 2008, announced that he would retire later in 2017. A national search began in the spring for his successor. September: Freda Ceaser was named CCC's director of Equity and Inclusion. She was previously the Director of Employment Services at CCC's Employment Access Center. April: CCC highlighted our robust volunteer program and partnerships during National Volunteer Week. August: CCC celebrated National Health Center Week by sharing the many ways we extend our health care work past clinic walls and directly to where people live. 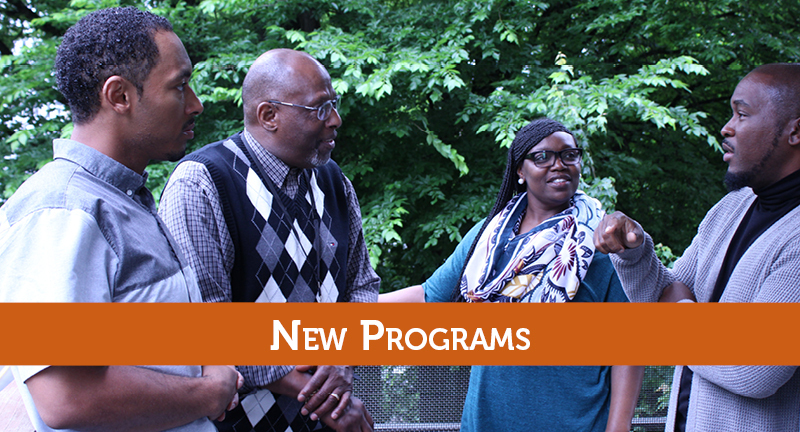 The Imani Center program increased the number of people they serve with culturally responsive Afrocentric approaches to mental health and addictions treatment by 50 percent. They also held the first two graduations in the program's history. 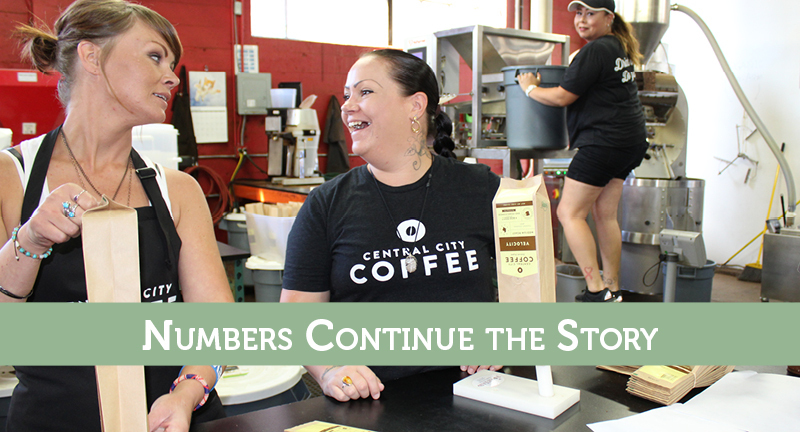 CCC's social enterprises—Central City Coffee, the Central City Bed, On-call Staffing and CCC Clean Start—employed 80 formerly homeless clients over the year. CCC's Recycling and Reuse Operations Center, a program that gives abandoned property a second life, processed more than 44,000 pounds of items (91% of which was kept out of the landfill) and provided nearly 700 clients with much-needed household items and clothing. On a crisp, sunny morning in Portland’s Director Park, the Downtown Clean & Safe board members gathered to celebrate the good work of the organization and appreciate some key people. 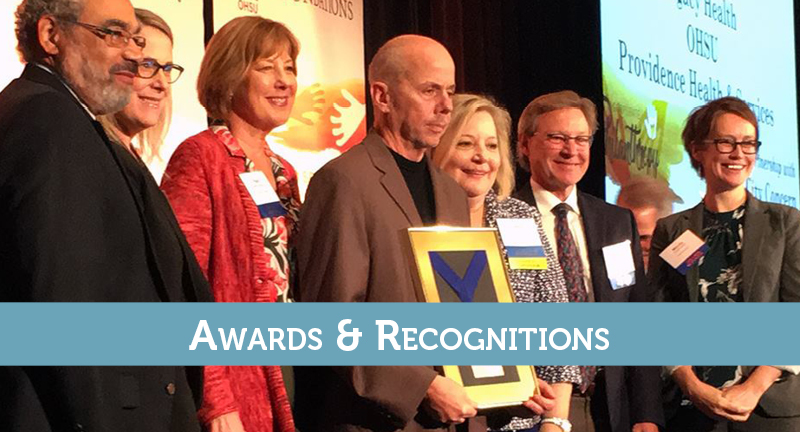 CCC’s President and CEO Rachel Solotaroff then presented two Cleaner of the Year awards to Greg Davis and Matt Carr. 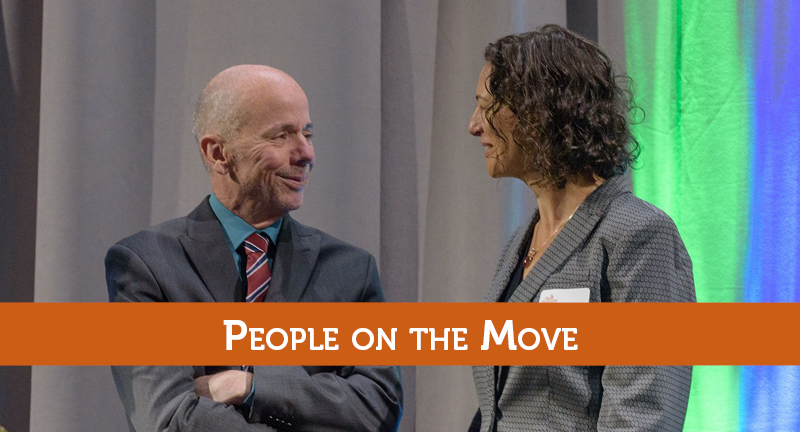 “Greg is extremely personable, professional and a fantastic ambassador for Central City Concern..."
Carr, born and raised in New York, and moved to Portland in 1992. He spent the majority of his adult life struggling with addiction. After a few attempts to trying to get clean on his own, he realized he couldn’t do it alone. In June 2016, Matt was accepted into Central City Concern’s Recovery Mentor Program. 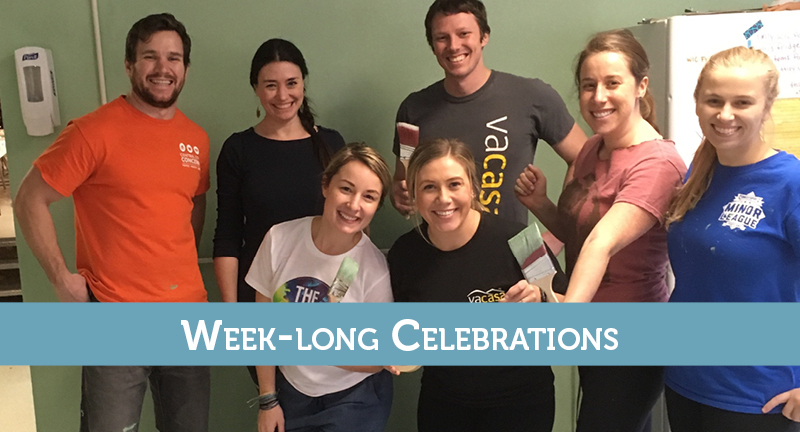 During this time, Matt successfully completed CVC by spending 80 hours giving back to the community at local non-profits. After his completion of the CVC, he was hired to work as a trainee at Clean & Safe in February 2017. Matt proved to be an extremely reliable and dedicated employee, who was always willing to go above and beyond. Matt showed so much pride in his work, he was promoted to be the third Clean & Safe special projects bicycle cleaner. Andrews then presented the Security Officer of the Year awards Officer Josh Dyk and Officer Samson Blakeslee. The Portland Downtown Business Improvement District contracts with CCC to keep clean a 213-block area in central downtown and along the bus mall. In six-month trainee positions, CCC Clean & Safe employees remove graffiti, contribute to public safety, and keep downtown free of litter and debris. Clean & Safe hires its employees from CCC's Community Volunteer Corps program. Toward the end of their six-month work experience, Clean & Safe employees engage in practical, employment development workshops at the Employment Access Center where they also may also access one-on-one assistance in the job search process. Some graduates of Clean & Safe move onto employment at Central City Concern in janitorial, maintenance, pest control and painting roles that maintain CCC’s 23 buildings. As the weather warms and the days grow longer, people take more notice of what’s going on in their neighborhoods. Central City Concern’s (CCC) Clean Start program helps keep neighborhoods clean by clearing away trash and removing graffiti. It’s also a mentored six-month work experience that gives people an opportunity to work, grow and gain crucial experience and confidence to pursue employment opportunities. CCC Clean Start runs three Portland crews and one in Gresham, each consisting of two people and a truck. Local residents can access CCC Clean Start through the City of Portland’s One Point of Contact page online form or the PDX Reporter app. The City reviews the request and often calls upon CCC Clean Start crews to visit the area to clear trash or assist campers with cleaning. CCC Clean Start crews do not move people from sites or participate in campground “sweeps.” Their mission is to help keep neighborhoods free of litter and debris, as well as to provide residents of encampments with resources to maintain a safe and hygienic environment. In April 2017, the three Portland CCC Clean Start crews removed 3,511 bags of trash and 1,350 needles. Additionally, CCC Clean Start contracts with the Portland Downtown Business Improvement District to operate Downtown Clean & Safe, a service that cleans a 213-block area in central downtown and along the bus mall. CCC Clean Start also operates a temporary storage locker near the west end of the Steel Bridge where people who have no place to call home can put their belongings for a few hours while they work or seek employment. Each two-person team has a trainee who once experienced homelessness. These trainees receive minimum wage, work 40 hours per week for 6-months and learn valuable soft skills. Toward the end of their six-month work experience, CCC Clean Start employees engage in practical, employment development workshops at CCC’s Employment Access Center where they receive one-on-one assistance in the job search process. Some graduates move on to CCC employment in janitorial, maintenance, pest control and painting roles that maintain CCC’s 23 buildings. Others find permanent employment outside of the agency. CCC Clean Start program keeps neighborhoods clean and gives workers a chance to gain experience and skills. It’s a win-win. For more information, visit the CCC Clean Start webpage.